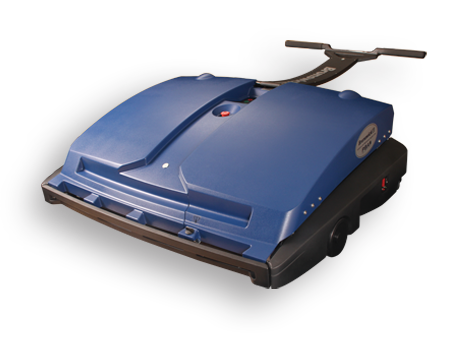 Since the introduction of the B90 oiling machine in the 1960s, Brunswick has been a leader and innovator in automatic lane maintenance systems. And we’ve learned a lot along the way. The Envoy, our newest lane machine, is a state-of-the-art system centered around your needs. Today’s center requires an intelligent machine that is so simple to operate that a new employee can run the lanes. Envoy has everything your center needs, and the ability to create any shot your bowlers expect. It is truly a system centered around you. When you talk about lane maintenance, you’re only as good as your conditioning system – and Envoy delivers industry-leading performance. With the accuracy competitive bowlers have come to expect, Brunswick’s Direct+ system provides individual board-by-board application for superior pattern consistency. That’s why it’s been used for every PBA Pro Tour tournament since 2006. Direct+ applies conditioner simultaneously across the entire lane through 39 individually controlled Accu-ject injectors. Direct-to-lane application for each board provides unmatched consistency – no zigzags or multi-component transfer systems to blur the results. With Direct+ conditioning, you know the right amount of oil is on the lane exactly where you want it, regardless of lane typography. Oil application is computer controlled by varying the injector pulse rate, not the speed of the machine. Machine speed is set to optimize cleaning and minimize time on the lane. The on-board heater warms conditioner oil to 80°F, ensuring consistent application, while the buffer brush finalizes taper for smoother transitions. Leveraging fuel-injector technology from Mercury Marine, a division of Brunswick, Direct+ applies conditioner simultaneously across the entire lane through 39 individually controlled Accu-ject injectors. Direct-to-lane application for each board provides unmatched consistency – no zigzags or multi-component transfer systems to blur the results. What good are great pattern options if you can’t figure out how they work? The Envoy features a Graphical User Interface (GUI), making programming a breeze. Easy-to-read color displays are just as simple to use. 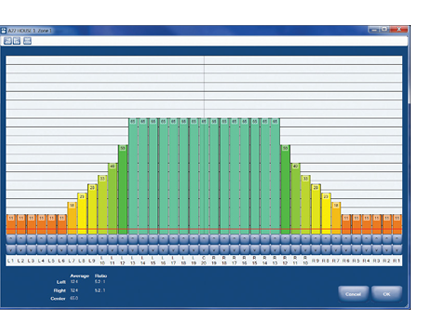 Programming in units – the same measure used by the Computer Lane Monitor to assess pattern compliance – takes away the guesswork so adjustments can be made in seconds. The GUI can be removed for programming when and where it’s convenient. With Direct+ GUI, customizing the patterns that work for your bowlers is a snap. The GUI navigation is controlled by simple six-button keypad below the full color screen and a redundant six-button keypad on the T-handle. The GUI can be removed for programming when and where it’s convenient. The easy-to-read GUI displays battery voltage, charging status and more. It even assists with troubleshooting through an easy diagnostic program. Color graphics display each pattern’s programmed zones and oil levels. Multiple levels of security are available to control which machine functions can be accessed and adjusted by different users. 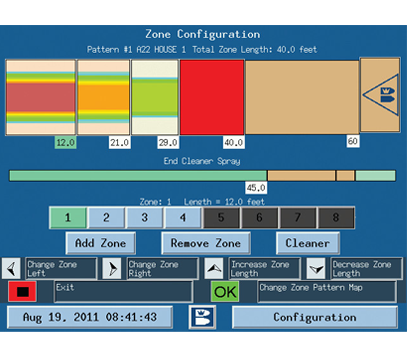 Error messages automatically notifies the user when cleaner and conditioner levels are getting low. Automated logs track and record time and user name for major functions including: pattern application, pattern design changes, and maintenance and system messages. Patterns are defined in “units,” removing the guesswork of programming in “loads.” The GUI stores 10 active patterns, and another 40 in memory. Use the Brunswick Crown Pattern Zone to download and use patterns for leagues, tournaments and special events. Use Pattern Manager and Pattern Editor to create or edit your own patterns. Patterns can be adjusted one board – or groups of boards – at a time. When it comes to lane performance, cleaning is a big part of the equation. With Envoy, machine speed is selected to optimize cleaning. Its four new cleaner nozzles are 50% larger to resist clogging. The unique V-shaped squeegee head guides waste for quick, efficient pick-up. Even our absorbent wiper rotates and the squeegee blades flip to allow for multiple uses and reduced maintenance/operating costs. It’s a timesaving design that just makes sense. Black powder coated frame and black zinc coated GUI and electronic enclosure add style while helping guard against corrosion. Simply put, Envoy delivers state-of-the-art power performance that can’t be rivaled. With multiple battery and AC power options, this system provides primary and supplemental power you can always depend on. Our AGM batteries cover a minimum of 32 lanes with a single charge while the Lithium batteries can handle 60 lanes between charges. Whether you’re hosting a big tournament or just a heavy league day, with FlexPower, you are always ready to roll. The universal battery charger operates on 100-250V AC input and comes with your choice of AGM or Lithium batteries. 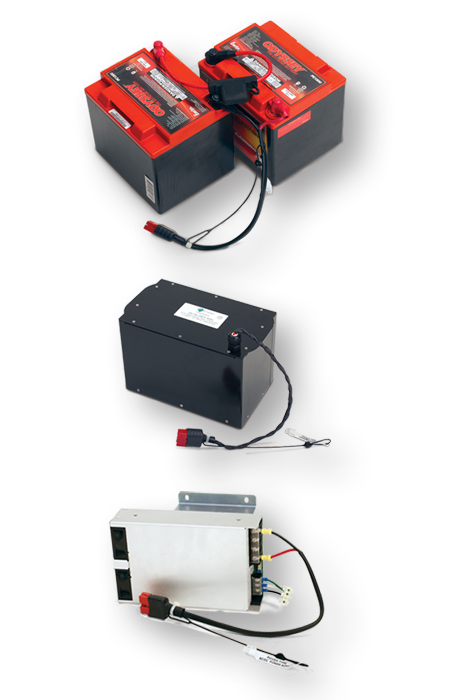 All machines are prewired for the optional on-board AC/DC power supply used for corded operation. Built with flexibility in mind, the Enovy converts from battery power to corded operation in minutes and is versatile enough to charge from the transport or operating position. Remote controlled emergency stop shuts off machine when operating on battery power, protecting the Envoy and pinsetters from damage if the lane is accidentally turned on. Unparalleled performance and flexibility make Envoy easy to understand and even easier to use. In fact, a new user can get up to speed in less than 30 minutes. Innovations like our EZ steer technology improve lane positioning and maneuverability with a new large front wheel design. 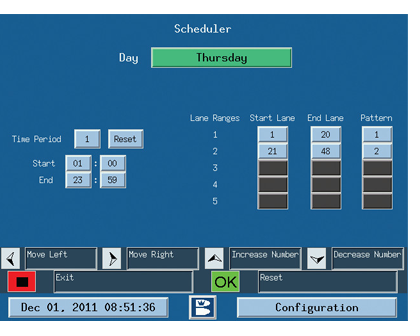 Envoy can also be pre-programmed to apply different patterns on different sets of lanes for different leagues on different days. And daily maintenance is simple – just refill, clean and wipe down the machine after use. User friendly with no wasted time and effort – that’s Envoy.